The government shutdown may be over, but the data about its economic impact are just starting to come in. About 70,000 federal workers filed for unemployment benefits the first week of October, the Labor Department reported Thursday. 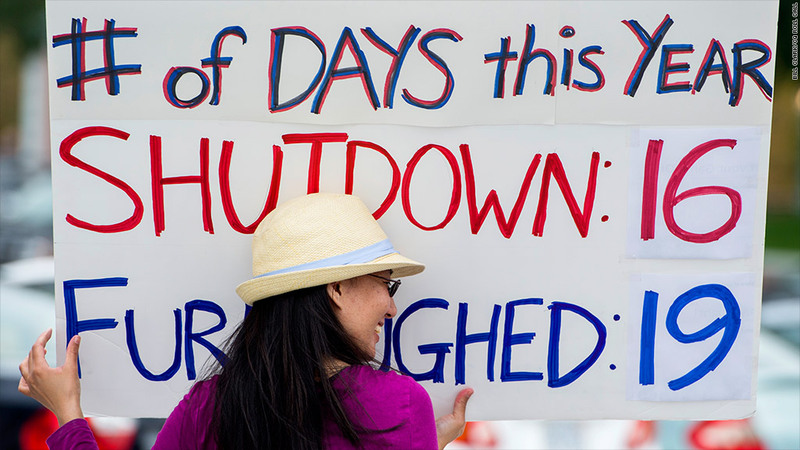 The shutdown began Oct. 1 and lasted 16 days, putting thousands of federal employees temporarily out of work and without a paycheck. Many were allowed to file for unemployment benefits during that time, but now that Congress has agreed to grant their pay retroactively, most states will ask these workers to repay the money later. This isn't the first time furloughed workers had to return their unemployment checks. During the government shutdown in 1995 and 1996, state agencies also tried to recoup the overpaid funds. The Department of Labor's report doesn't cover the entire shutdown period yet. But CNNMoney obtained numbers separately from several states, showing federal workers filed a total of 20,000 claims in Maryland, 16,000 claims in Washington D.C., 7,600 claims in Pennsylvania and around 6,000 in Virginia during the 16-day shutdown. Even though the shutdown has ended, more claims could still be submitted. The report also shows the shutdown temporarily drove unemployment claims higher among the broader population. First-time claims spiked to 373,000 two weeks ago, and then fell back to 358,000 last week. The Department of Labor attributed part of the spike to the shutdown, but also indicated a large part of the increase was due to processing delays in California. The state recently updated its computer systems. The initial claims report took on increased importance as a measure of the strength of the job market recently, as it was one of few government reports uninterrupted by the shutdown. The Department of Labor still has not released its monthly jobs report for September -- a key indicator that tallies the number of jobs created and calculates the nation's unemployment rate. The agency has not yet announced when it will reschedule that report. The Federal Reserve next meets on October 29 and 30. Fed officials have repeatedly said their decisions are based on the data, and it's unclear how a delay in government reporting will impact their debate on when to pull back their stimulus program.